I got a Crumpler 3 Millon Dollar Home Camera Sling bag for testing and the most remarkable thing about it IMHO is that it fits my Nikon DSLR body (and I thought it was good only for the compacts and mirrorless cameras). Not that I advocate carrying a DSLR this way but was just thinking there are days when lugging a camera bag gets to be a hassle and decidedly un-discreet. For my little experiment, I just removed the blue divider with flap and my vintage D200 body went in smoothly, a snug fit. Perfect for street shooting when I'll just carry a 50mm, f/1.8 Nikon lens in my pocket and I can shoot incognito. My test model is in Rifle Green color (other available colors are black and dark red). Hanging beside my grey Black Diamond fanny pack and black and grey Deuter belt bags, it stood out like the proverbial sore thumb, though in a nice way. Design and build. I like the color combination I got - predominantly green with blue trim and yellow front compartment. The latch is standard Crumpler - easily locks but is otherwise secure. The use of nylon webbing all over is very much appreciated as it repels dirt and moisture. 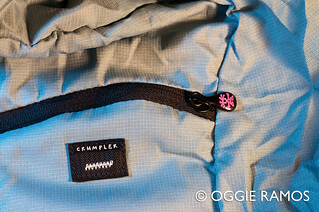 Stitching is Crumpler-standard: clean and looks like it can stand up to much abuse. The sling strap looks durable; the locking mechanism locks securely but not cumbersome to detach. Functionality. 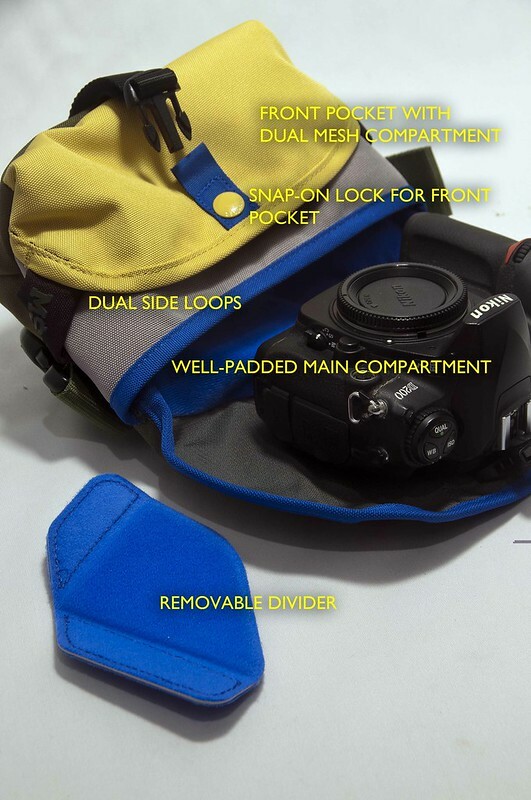 The main compartment is padded well, the better to keep your camera in place and safe from scratches. For compact camera users, the divider flap lets you reconfigure the compartment (for mirrorless cam users to store an extra lens). 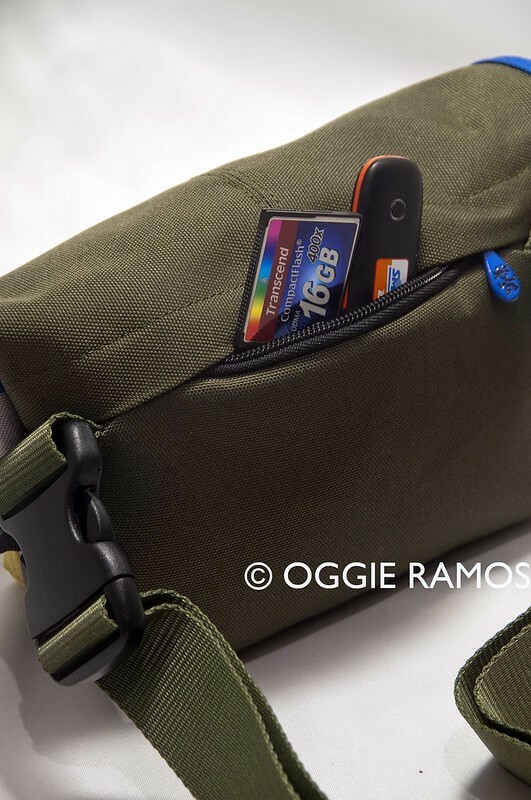 The front pocket is sufficiently deep to keep stuff from spilling out; a dual mesh net right at the back of the outer shell is good for organizing memory cards and/or extra batteries. A snap-on button secures the front compartment even when the main flap is unlatched. Nitpicks. Like the 4 Million Dollar Home I scrutinized earlier, this has dual side loops which I find little use for (again, too taut for hanging much of anything like a carabiner) but I guess it also keeps the form of the bag even if it's not full. Again, like in the 4 Million Dollar Home, there's a zippered slim back pocket good for small stuff (a filter, even loose change or bills) you can get in a hurry without opening the main compartment. Verdict. 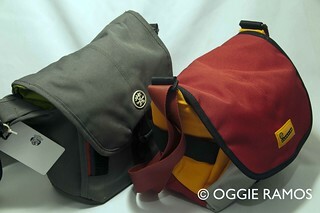 For someone who's really not into shoulder bags, I actually prefer sling bags like this one. 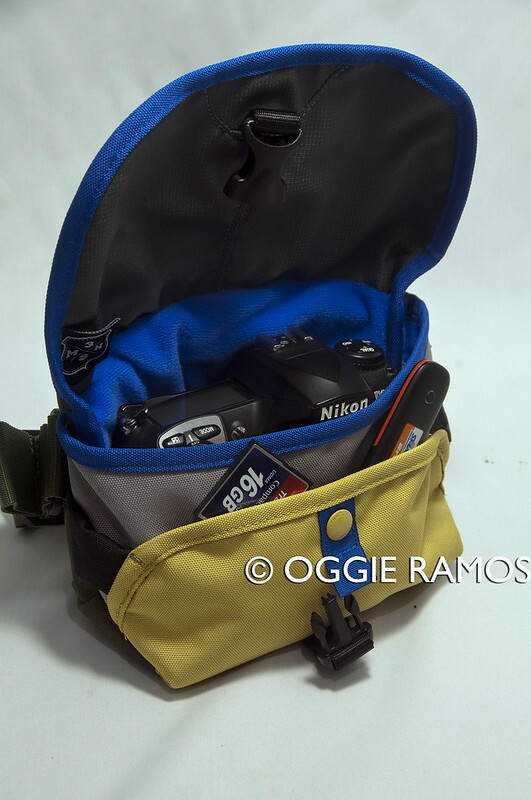 Was surprised a 2-Liter pack can accommodate my DSLR body. I wouldn't mind having one. Product info: Available at Crumpler Philippines stores in Bonifacio Global City, Trinoma, Robinsons Magnolia and the flagship store at the East Wing of ShangriLa Mall. Also at the ff. stores: Beyond the Box, Canon, DigiHub, Digital Arena, Digital Hub, Digital Walker, Digital Walker Zoom, District 32, G-Stop, GBX, F8 Photoshop, iCenter, Islands and More, iStudio, Macy's Camera, Mobile1, Nikon Store, PRG Photoshop, Rustan's, SM Department Store, Toby's Arena, Trilogy, Urbanathletics • Retail price: P2,950 • Visit www.crumpler.com or the Crumpler Philippines Facebook page.